Occasionally, you get to work for incredible people. This was the case with my last Commanding Officer during my last assignment. In the military, the backgrounds of most of the people is so varied, it is nice to finally work for someone who shares in your experiences. My boss was nothing less than an awesome mentor and great leader. I wanted to present him with a memento that would say more than just “thanks”. 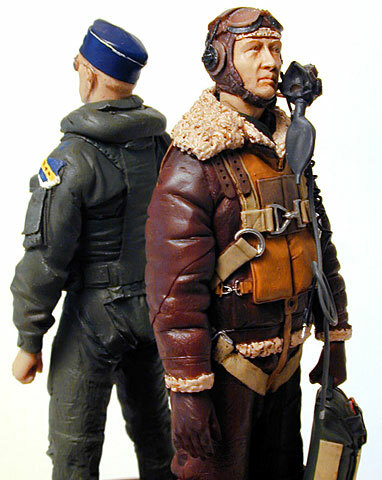 During the time I worked for him, I found out that his father was a Navigator on B-24s during WWII. 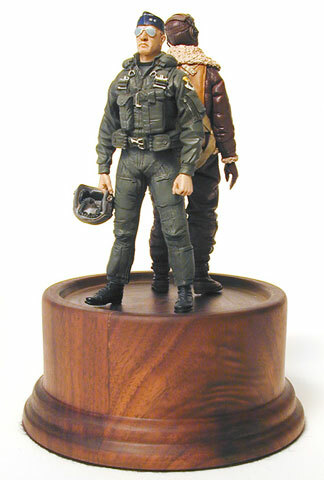 Knowing how much he looked up to his father, I thought a small vignette showing the two would be very memorable. Not too unlike the influence my boss has had on me. I call the vignette “From whence we came”. In cases like these, time is never your friend. I hate modeling deadlines! 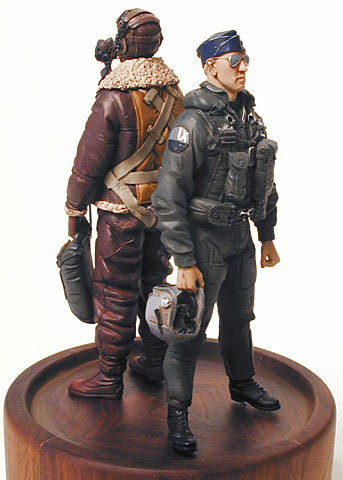 Fortunately, Verlinden had two figures that met the calling. 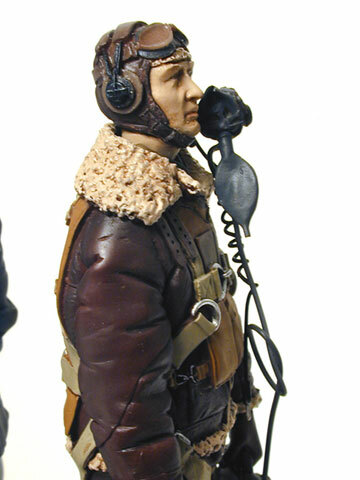 The figure representing the B-24 figure is the Verlinden 200mm “Memphis Belle” aircrew figure. 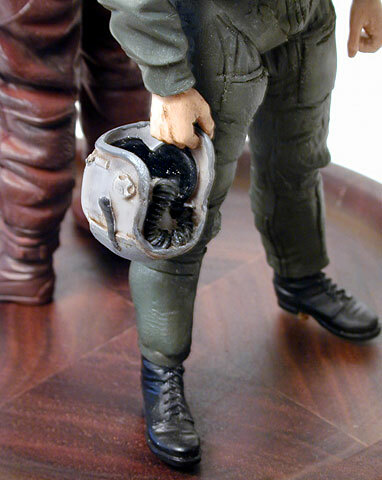 Basically done straight out of the box with belts made from Tamyia two-part putty. The paint is all airbrushed Tamyia with the exception of the small bits. A coat of future and an oil wash was finished off with a flat coat of acryilic. 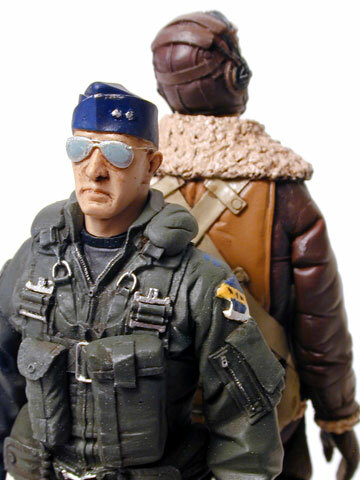 The modern bombardier who represents my boss is the Verlinden 200mm “Top Gun” figure that was modified to represent more of an Air Force style flight suit and helmet. 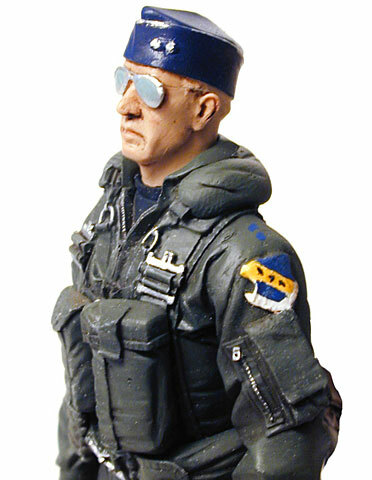 Again, this figure was finished using Tamyia Putty and Super Sculpey for the details. Paint and finish was the same as the WWII Bombardier. I wanted a base that had a solid look but not too blocky. This base was made by gluing four block of Walnut together and turning it down to shape. It adds just the right dimension to the vignette.